Last night’s Oscar ceremony was a doozy, judging by Taraji P. Henson’s expressions, and well, that whole Best Picture snafu. But even before Mahershala Ali made history as the first Muslim actor to win an Academy Award, people who’d tuned in to watch the proceedings were sitting in stunned silence. That’s because Disney unveiled the first look at James Cameron’s Avatar theme park, which he seems just as excited about as the sequels. The director’s promoted Pandora’s earthly construction since it was announced a few years ago, releasing artist renderings of its foliage and vegetation—which is what people primarily remember about the movie, and not, say, the tall blue people with penetrating ponytails. Now just two years after that video was shared, we have a commercial that marks the official opening of the theme park. There’s some fairly standard stuff here: Cameron touting the park’s wonders, including riding a banshee and “dreaming with your eyes open,” whatever that means. Yep, this all looks like your average vacation promo—but, wait, what the hell is that at the end? It appears to be a female Na’vi. 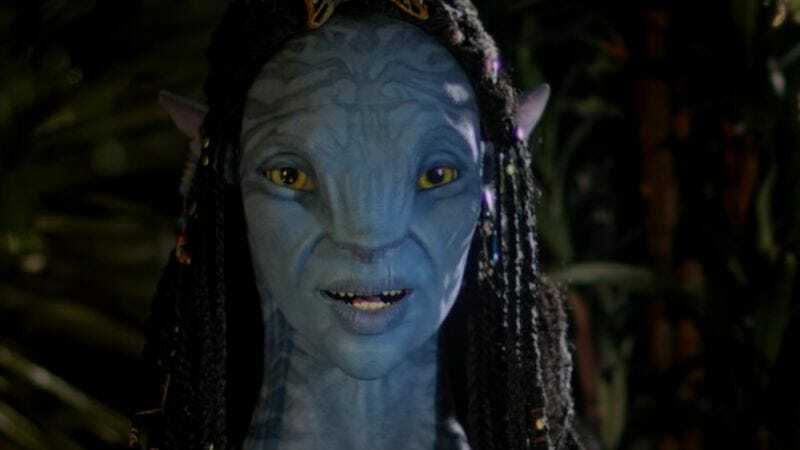 That makes sense, because the Na’vi are Pandora’s natives, after all. But why is the actress making such weird expressions between her sentences—was she unimpressed by the script? Anyway, Pandora: The World Of Avatar opens May 27 in Disney’s Animal Kingdom, which will almost certainly not end up being ground zero for Skynet.